Last month, Yaroslav Nikitenko received his first death threat. The veteran campaigner speaks on environmental activism in Russia today. “Shut the hell up, or...” reads this graffiti outside the activist’s apartment. “Yaroslav Nikitenko lived here”, reads the gravestone. 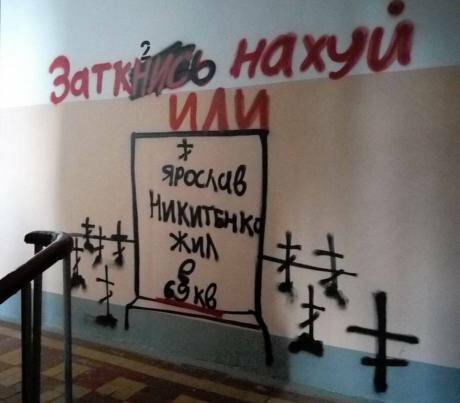 Photo courtesy of Yaroslav Nikitenko.On 12 April, Yaroslav Nikitenko woke up to a frightening sight by the entrance of his apartment: graffiti reading “Shut the hell up or…”, the phrase accompanied by a drawing of a gravestone bearing Nikitenko's name. It was encircled by black crosses. Nikitenko, a 29-year old physicist working at the Institute for Nuclear Research at the Russian Academy of Sciences, had spent the last months campaigning against the building of a luxury residential complex at 21 Zhivopisnaya street. It’s a great location, by the Moskvoretsky pine forest, on the banks of the Moscow river. Of course, such a project attracts powerful people. And Nikitenko is sure that his campaign against this project is the reason behind this death threat. Nikitenko is a seasoned activist, having fought alongside the renowned ecological protester Evgenia Chirikova to oppose a planned Moscow-St Petersburg highway through the Khimki forest in northwest Moscow. Although the highway was built, and Chirikova left the country after harassment, the hard-fought campaign against it encouraged further civic activism in Russia. In 2012, Nikitenko was detained for ten days after taking part in an opposition protest. These days, Nikitenko’s involved with the ongoing struggle against the demolition of Moscow’s Soviet-era housing stock. But the graffiti was a watershed moment: this was Nikitenko’s first death threat. 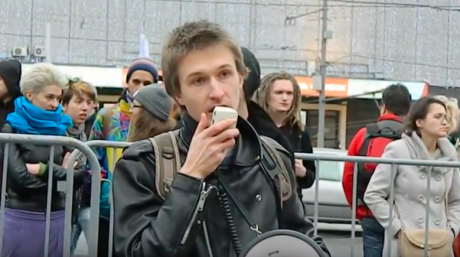 He spoke to openDemocracy about the local campaign against the residential complex at 21 Zhivopisnaya street, and the personal cost of publicly-minded activism. Yaroslav, this must have been a terrifying experience. How would you describe your feelings right now? I'd never received a threat like this in my life, so this was very strange and unexpected. Whenever I get involved in some public campaign, I am always aware that there are risks, that it’s dangerous. I don't feel safe because I know that many activists just get beaten up on the street while they walk home after protesting. And now, I feel even less secure. But I just want to live my normal life, not to hide anywhere. As soon as I saw the graffiti, I called the police and filed a complaint. They documented the evidence and began an investigation. Unfortunately, they also refused to open a case against those who did it, saying that the graffiti was “innocent” and “not life-threatening”. I believe that as the people who threatened me saw the public response to their act (the death threat was covered extensively by Russian media), they won’t dare to do more. It's not in the interest of powerful people that society at large learns too much about their methods of intimidation. Tell us more about what started it all: the campaign you’re involved with to stop the residential complex at 21 Zhivopisnaya street. The residential complex is being built in the Moskvoretsky Park, a natural pine forest on the banks of the Moscow river. It’s a beautiful place (“Zhivopisnaya ulitsa” literally means “picturesque street”) which many people use for recreation – they go there to walk with their children, for example. There is a plot of land where a horse-riding school used to be, which was leased out some years ago to a private company called Capital Group. In 2000 (and once more a few years later), the company tried to get permission to construct a residential building there. The municipality refused, as the general plan of Moscow doesn't allow for high-rise buildings in Moskvoretsky Park, which is a specially protected natural area. The specific plot of land at 21 Zhivopisnaya street is also recreational and sports zone, so it’s subject to further restrictions. “Ecology concerns us all. It’s the right of free citizens to drink clean water and breathe fresh air.” Yaroslav Nikitenko at a rally in 2015. Image still via YouTube / Zuban. Some rights reserved.But last year, the plot was taken over by another company, OOO Stroitel (a subsidiary of a company belonging to Viktor Vekselberg, one of Russia's richest oligarchs). Moscow mayor Sergey Sobyanin very quickly gave all the permissions necessary to construct the building. As I was involved in the local campaign to halt construction, we held several events, including bringing a petition to the city administration of some 14,000 signatures, asking for construction to be prohibited and to preserve the natural park. To be precise, the building isn’t inside the protected forest, but it is surrounded by it on three sides. As a result, communication routes to the building may require felling pines trees or developing the riverbank. There’s also the threat of increased anthropogenic load on the park. As they are legally prohibited from building on it, the company insists that they’ll leave the embankment alone. But experience says otherwise; we've already seen the law violated in the case of another building just ten minutes away. Yet the company does have the legal permission to build here, in at least some areas. Can you do anything from a legal point of view? That’s right, they have been granted permission to construct the building, but even that’s illegal in itself. We have not even attempted to challenge the construction permit in court, because courts, especially in Moscow, are extremely corrupt. Many groups who try to defend their rights via this route end up losing, and then everybody tells them “they're wrong” because some [corrupt] court ruled against them. The head of the company constructing this building (Elitkompleks, of which OOO Stroitel is a subsidiary) is a man who used to work in the Moscow city administration and then set up his own construction business. With that in mind, it's pretty possible he still has connections inside the municipal authorities. What’s undeniable is that the company doesn't have permission to build auxiliary infrastructure in the protected nature park, which they are already doing. The Moscow environmental prosecutor actually sued the company before a Moscow court because of this, demanding that the part of access road that was built inside nature park be removed. We are still waiting for a final ruling. That this prosecutor took action against the residential complex at all is quite extraordinary. But even they had a hard time doing it - despite being government officials, they had to appeal twice to get the case to progress. So, the building is already under construction, the courts are not to be trusted and powerful interests seem determined to make this project a success. Why do you keep fighting? There is no reason to stop fighting! We have even seen cases – some in Moscow – where a completed but illegal building was torn down after authorities finally decided to take action. This building on 21 Zhivopisnaya street is illegal for many reasons. It’s contradictory to the general plan of Moscow, it’s being built without the proper safety requirements, and without any public hearings. This autumn, we’ll have elections for municipal deputies for Moscow's districts. Who knows, maybe upon seeing the opposition, the party in power might decide to halt this project because of political risks? There are many possibilities to stop this. 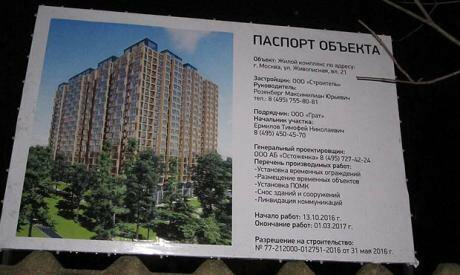 Information about the planned building at 21 Zhivopisnaya Street, whose construction is opposed by local residents and activists such as Nikitenko. Photo courtesy of Obshchaya Gazeta. Some rights reserved.Our first campaign set its sights on the mayor of Moscow, but he was very unresponsive and didn’t seem interested in taking action. Now we’re taking it higher, and are addressing the president of Russia with our petitions. After all, he is the guarantor of our constitutional rights. At least, technically speaking. If something changes in Moscow or in Russia, it doesn’t happen simply because of illegalities, it happens because of people’s protests. We may not have laws which are respected or even normally functioning courts, but we do have protests and the government is afraid of them. You’ve been at this for many years. How has being an activist in Russia changed since you started out? I became an activist in 2008 when I was finishing my university studies and had more free time. Back in 2008, there were much fewer activists in Russia than today. Our civil society was small. Now there are many more of us, but still not enough. Everyone chooses the level of risk they can take. It’s most dangerous for those who organise and lead protests, but less so for the majority of activists, though they may come under pressure, for example, at work. Back in the 2000s, the actions taken against activists were more dangerous; we know of many politically-motivated murders from those days. Today, many activists and journalists have been attacked with bright green paint or even antiseptic. So, while there is a crackdown underway against civil society, there appears to be less physical danger. It could be that actions against activists are more visible nowadays, due to immediate coverage on the internet. What makes activism in Russia different than that in other countries? Immensely corrupt legal and law enforcement systems. Laws may say one thing, but they’re applied selectively, and we have little recourse through the courts anyway. Our case on Zhivopisnaya street is a good example; even though a state regulatory body declared that operations to install an electricity cable for the building were illegal, works continued nevertheless the following day. The police took no action to stop them. Do you feel that the death threat you received will deter young people from activism? What advice would you give them? I don’t think young activists need my advice. The impulse for activism comes from within; from yourself and your own values. The many causes we fight across Russia are all unique, so demand unique responses. But if I had to offer advice… perhaps I’d recommend that every activist learn martial arts. That might come in useful in our lives.